Also, when you get finished checking out our gay and lesbian honeymoon selections here; please feel free to check out JustGayHoneymoons for some more exciting destinations! Where better to start our list off than with the first U.S. state to legalize gay marriage? The most popular destination spot in Massachusetts with gay and lesbian folks nationwide is Provincetown. How about we find out what you can do there and where you can stay? Now you knew we would have New Jersey second on our list since they just recently approved of gay marriages as well! There are so many great beach locations in Jersey that if you are a couple that loves the water, you'll definitely feel right at home here. Plus, if you're a couple that loves to gamble a little (I know I love me some poker!) then you'll have plenty of casinos to choose from too, if you decide to stay near Atlantic City. What's New Jersey all about? Find out here. Beautiful, sunny California has one city that is known as the "Gay Capital of the World," and that city is San Francisco. Let's check out that ever poplular city and we'll also take a peek at more locations in California that you just may want to consider for your honeymoon destination. Is Hawaii not the most beautiful setting that anyone, gay or straight, could ask for when talking about having a wedding? Hawaii has many beautiful islands and so many gay friendly spots that you'll feel very comfortable sharing your commitment with one another here. 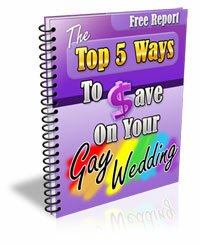 Let's check out the different places to visit there for your gay honeymoons and lesbian honeymoons. Connecticut offers a beautiful view in the fall with all of the foliage around. What a lovely time of year to share your love and commitment for one another. And can you imagine the PICTURES that you would get with the fascinating fall foliage around? There's more to do in Connecticut then you may think. Let's check out the attractions. Vermont has many, many beautiful locations to choose from for your special,once in a lifetime honeymoon. Let's check out some different skiing resort towns and some towns that have some breathtaking picturesque scenery. Perfect for picture taking during your gay honeymoons and lesbian honeymoons. Ahhhhh beautiful Mexico! An awesome and romantic destination for gay and lesbian couples is Puerto Vallarta. Puerto Vallarta has one of the largest gay populations on Mexico's Pacific Coast. What's going on in Mexico? Now would be an great time to visit Cape Town, South Africa. Show them your support after they just showed their support for gay commitments by approving gay marriage! Many gay and lesbian couples have found Cape Town a perfect destination for them to spend quality time together. Ok, I'm sorry about my lil bit of sarcasm. Now back to Canada. There are so many spots in Canada that have breath taking views that you just may have a tough decision picking just one spot for your honeymoon. Niagra Falls has always been a favorite for folks, but let's see what else Canada has to offer for gay honeymoons and lesbian honeymoons. Spain can offer plenty of awesome places for your gay or lesbian honeymoon! We will explore a couple different areas in Spain that are extremely gay friendly. Two that you may or may not already be aware of are: Cheuca in Madrid and Stiges, just outside of Barcelona. Let's explore theses areas more and find out what they have to offer! Sign up below for FREE for our Gay Goodies Galore Newsletter and receive tips, updates and deals in regards to gay marriage, gay or lesbian weddings, honeymoons, and a whole lot more!